Map-based cloning of quantitative trait loci (QTLs) in polyploidy crop species remains a challenge due to the complexity of their genome structures. QTLs for seed weight in B. napus have been identified, but information on candidate genes for identified QTLs of this important trait is still rare. In this study, a whole genome genetic linkage map for B. napus was constructed using simple sequence repeat (SSR) markers that covered a genetic distance of 2,126.4 cM with an average distance of 5.36 cM between markers. A procedure was developed to establish colinearity of SSR loci on B. napus with its two progenitor diploid species B. rapa and B. oleracea through extensive bioinformatics analysis. With the aid of B. rapa and B. oleracea genome sequences, the 421 homologous colinear loci deduced from the SSR loci of B. napus were shown to correspond to 398 homologous loci in Arabidopsis thaliana. Through comparative mapping of Arabidopsis and the three Brassica species, 227 homologous genes for seed size/weight were mapped on the B. napus genetic map, establishing the genetic bases for the important agronomic trait in this amphidiploid species. Furthermore, 12 candidate genes underlying 8 QTLs for seed weight were identified, and a gene-specific marker for BnAP2 was developed through molecular cloning using the seed weight/size gene distribution map in B. napus. Our study showed that it is feasible to identify candidate genes of QTLs using a SSR-based B. napus genetic map through comparative mapping among Arabidopsis and B. napus and its two progenitor species B. rapa and B. oleracea. Identification of candidate genes for seed weight in amphidiploid B. napus will accelerate the process of isolating the mapped QTLs for this important trait, and this approach may be useful for QTL identification of other traits of agronomic significance. Rapeseed (Brassica napus L., AACC, 2n=38) is one of the world’s most important oil crops and provides not only edible oil for human diets, but also protein-rich feed for animals and raw materials for industrial processes such as biodiesel production. B. napus is an amphidiploid species derived from the hybridization of its two diploid progenitor species, B. rapa (AA, 2n=20) and B. oleracea (CC, 2n=18) . Studies have shown that Arabidopsis thaliana, B. napus, B. rapa and B. oleracea have a common ancestor [2–6]. Seed weight is one of the three yield components (siliques per plant, seeds per silique and seed weight) of plant productivity of rapeseed and is also related to oil and protein content [7–9]. Extensive efforts have been made in mapping of the QTLs for seed size/weight in crop species [10–14], and genes governing seed size/weight have been cloned in model plants Arabidopsis and rice through mutant analysis and map-based cloning [15–18]. However, molecular cloning of seed size/weight genes in other crops, such as rapeseed, wheat and soybean lags behind due to the more complicated genome structures of these crops and limited availability of genome sequence information. Quantitative genetic analysis in B. napus showed that seed weight has a relatively high heritability and may primarily be controlled by genes with additive effects [11, 14, 19–21]. Quijada et al. detected three QTLs (located on N7, N17 and N19, respectively) for seed weight in different populations and environments, but no common QTL was identified. Udall et al. found 6, 4 and 5 QTLs of seed weight in Hua DH, SYN DH and testcross populations, respectively, with only one QTL (located on N14) detected in all populations and environments. Shi et al. mapped 159 QTLs of seed weight in TN DH and RC-F2 populations across 10 environments with only one major QTL (qSW.A7-2) identified in all environments. In our previous study , 9 QTLs for seed weight in a doubled haploid (DH) population of B. napus were identified, among which two major QTLs, TSWA7a and TSWA7b, were stably detected across years. Interestingly, seed weight QTLs on A7 were repeatedly detected in other studies with diverse genetic materials [11, 14, 21, 24]. However, little is known about the candidate genes for those mapped QTLs, and so far only two genes, BnMINI3a and BnTTG2a, were assigned as the candidate genes for TSWA5b and TSWA5c. It is thus crucial to develop procedures that can accelerate the process of mapped-based cloning by identification of candidate genes of those QTLs. Comparative mapping among related species is a powerful tool for genetic studies by offering the possibility of transferring genomic information from well-studied species to more genetically complicated ones. This advantage is particularly obvious in Brassicaceae, because Arabidpsis thaliana, as a model plant for dicots, has completed genome sequence , and a wealth of functional genomics information. Much effort has been focused on the comparative analysis between Brassica species and A. thaliana. Several comparative maps in Brassicaceae have been constructed based on RFLP markers, cDNA clones from Brassica species [2, 26–32]. Other types of markers, such as IP (intron polymorphism) markers from Arabidopsis, and gene specific markers based on Arabidopsis sequences were also used . So far, no comparative mapping with Arabidopsis has been conducted with genetic maps based on SSR markers or other unknown sequence markers. Wang et al. constructed an integrated linkage map of B. napus using mainly SSR markers with the aid of other type of markers including RFLP, and then attempted to identify homologous loci in Arabidopsis to these SSR markers. However, <2% of the primer pairs had homology in Arabidopsis, of which only 50% agreed with those identified using the corresponding SSR clone sequences. In such a case, it was difficult for comparative studies within Brassicaceae only based on the SSR marker primer sequences . On the other hand, in a comparative study based on 6, 5 and 6 BACs’ sequences from B. napus, B. rapa, and B. oleracea, respectively, it was found that most homologous loci in A and C genomes of B. napus, B. rapa and B. oleracea have colinear relationship with the same loci in Arabidopsis. This finding implies that using the SSR markers homologous loci information in the B. rapa and B. oleracea genomes may bridge the comparative analysis of B. napus and Arabidopsis. In order to transfer the gene information effectively from Arabidopsis to B. napus, we developed a procedure for comparative mapping among three Brassica species (B. napus, B. rapa and B. oleracea) and Arabidopsis based on a SSR linkage map in B. napus. By making use of the map, we identified the putative genes involved in seed weight/size regulation in B. rapa and B. oleracea, and mapped these genes onto the SSR-based B. napus genetic map. Such a seed weight/size gene distribution map will allow us to pinpoint candidate genes underlying seed weight QTLs, thus facilitating the genetic and molecular studies of seed weight control. A DH population of 190 lines was produced from microspore culture with a F1 cross between SW Hickory (a spring-type B. napus variety) and JA177 (a winter-type B. napus pure line), and named the SJ-DH population. The population was used for genetic and QTL mapping. Seed weight of each plant from the population was measured based on 500 fully developed seeds with three replications. The average seed weight was converted to 1000-seed weight (TSW) for each individual plant. The means of TSW of 10–15 plants from each plot were used for trait evaluation of parents, F1 and SJ DH lines. The detailed information for the production of the population, field trials and sampling procedures for seed weight measurement has been described previously . Primer sequences for SSR markers used for genetic mapping were described by Fan et al. and the sequence information of newly added SSR markers is provided in Additional file 1: Table S1. Linkage analysis with all markers was performed using MAPMAKER 3.0 . A minimum log likelihood of the odds (LOD) score of 11.0 and a maximum distance of 25 cM were used to group loci into linkage groups (LGs). Genetic distances between SSR loci were calculated using the Kosambi mapping function. The nomenclature of LGs follows the rules proposed by the Multinational Brassica Genome Project . QTLs were detected using the composite interval mapping (CIM) procedure with the software QTL Cartographer V2.5 . The parameters and methods for QTL mapping were described as Fan et al..
To align the SSR loci on each of the B. napus LGs to the homologous loci in the B. rapa or B. oleracea genome, electronic PCR (e-PCR)  was performed with the primers of the SSR markers mapped on the B. napus LGs and the genomic sequences of B. rapa (version 1.1) [6, 40] and B. oleracea (version 2011-06-30)  as templates. The parameters for e-PCR were set to allow three mismatches and one gap for a given primer pair. Amplicons produced from the e-PCR then were analyzed to determine their colinear relationship between the B. napus LGs and the chromosomes of B. rapa/B. oleracea. An amplicon is regarded as a putative homologous colinear locus on the A- (B. rapa) or C- (B. oleracea) genome to the locus defined by the SSR marker used for the amplification on a particular B. napus LG. A homologous colinear locus was determined when only three or more amplicons on a same chromosome of B. rapa/ B. oleracea could be generated with the SSR primers from a single LG of B. napus. Such a criterion would allow to reduce the non-specific alignment among a LG in the genome of B. rapa or B. oleracea, and to determine the orientation of a linear fragment, which is required to establish the corresponding linear relationship between a B. napus LG and a B. rapa/B. oleracea chromosome. where L is the variable describing the status of e-PCR amplification, while M is the number of markers that fall onto the chromosomes of B. rapa and B. oleracea (with successful amplification), x is the LG of B. napus, and y is the chromosome of B. rapa and B. oleracea, k is the marker index of each LG, and n is the markers number of each LG. When a marker (k) on a LG (x) has one or more amplifications on a particular chromosome (y), Lyk is assigned 1, otherwise Lyk assigned 0. The formula calculates how many possible amplicons are produced with the primers for the SSR markers in a particular LG. The script generates a list of possible homologous colinear loci on the chromosomes of B. rapa or B. oleracea for each linkage group of B. napus, the order of the homologous colinear loci were the same to SSR loci distribution on the LG. When a marker had multiple amplification loci on a same chromosome, the accurate position for a particular locus was determined manually by referring to the physical positions of its upstream and downstream amplicons. The Perl script described above was used to extract the sequences of effective amplicons in the B. rapa and B. oleracea genomes. The amplicons’ sequences were used as queries in searching for Arabidopsis homologues using the BLASTn program  against TAIR10  with an E-value of 1.0 as an initial identification of homologous loci in Arabidopsis. The less stringent E-value could allow more homologous loci included for the identification of conserved blocks. The positions and gene loci of best-hits in Arabidopsis genome sequences database were collected and comparatively mapped onto the B. napus LGs. Identification of the conserved Arabidopsis genomic blocks  on the B. napus LGs was performed essentially as described by Parkin et al.. A conserved block contained a minimum of three mapped SSR loci with at least two homologous loci from one of the 24 defined Arabidopsis bocks  every 10 cM in the B. napus genetic map. To identify and locate the putative seed size/weight genes in B. napus, the homologous sequences of seed size/weight genes in the databases of B. rapa and B. oleracea[40, 41] were first searched with the BLASTn  program (E value <1E-20 when using Arabidopsis seed size genes as query, and E value <1E-10 with the genes from other crops as query). The resulting sequences from the search were firstly mapped onto the chromosomes of B. rapa or B. oleracea and then placed on the B. napus LGs based on the homologous colinear relationships between B. napus and B. rapa/B. oleracea. Standard molecular cloning procedures  were followed to isolate the homologous genes of Arabidopsis in the parental lines of the SJ DH population. The genomic fragments corresponding to the AtAP2 gene were amplified using the primer pairs of AP2F (5'-ATGTGGGATCTAAACGACTCACCA-3') and AP2R (5'-TCAAGAAGGTCTCATGAGAGAAGG-3'). The PCR products from the parental lines were sequenced by the BigDye Terminator Cycle Sequencing v3.1 (Applied Biosystems, Foster City, CA, USA), and the coding sequences were predicted with the software SEQUENCHER 4.1.2 (Gene Codes Corporation, Ann Arbor, MI, USA). Previously, we constructed a genetic map with 297 SSR markers for the SJ DH population . In the present study, we expanded the SSR markers to 361 and re-constructed the map. In total, 397 SSR loci and 6 gene-specific markers were located to the new genetic map with 19 linkage groups (LGs). The markers covered a genetic distance of 2,126.4 cM (the previous map was 2,011.1 cM) with an average distance of 5.36 cM (the previous map was 6.15 cM) between markers (Figures 1, 2; Additional files 3, 4, 5 and 6: Figure S1-S4; Additional file 1: Table S1). The LGs corresponded to the 19 chromosomes of B. napus including A1-A10 (A genome) and C1-C9 (C genome) as determined by shared SSR markers in public genetic maps . All SSR markers were evenly distributed across the whole genome of B. napus with 199 and 198 SSR loci on genome A and C, respectively (Table 1). Seed weight/size gene distribution map of B. napus (A genome). Column a presents the genetic linkage groups of the SJ DH population. The nomenclature of LGs follows the rules proposed by the Multinational Brassica Genome Project . Each of the LGs is represented with a vertical bar with the locus position (in cM) on the left and SSR loci names on the right. The QTLs information (peak, interval and name) of TSW were on the left-hand of the LGs. Column b lists the homologous colinear loci in B. rapa or B. oleracea. The numbers designate the physical position in B. rapa or B. oleracea chromosome with the length of amplification fragment. Column c is the Arabidopsis gene codes corresponding to the homologous loci. Column d lists the homologous genes of seed size or weight identified in B. rapa and B. oleracea. Genes that are in good fit into both Arabidopsis and B. rapa/B. oleracea physical positions are marked with asterisks. Numbers in brackets are the tandem repeat times of the tandem repeated genes. Seed weight/size gene distribution map of B. napus (C genome). Column a presents the genetic linkage groups of the SJ DH population. The nomenclature of LGs follows the rules proposed by the Multinational Brassica Genome Project . 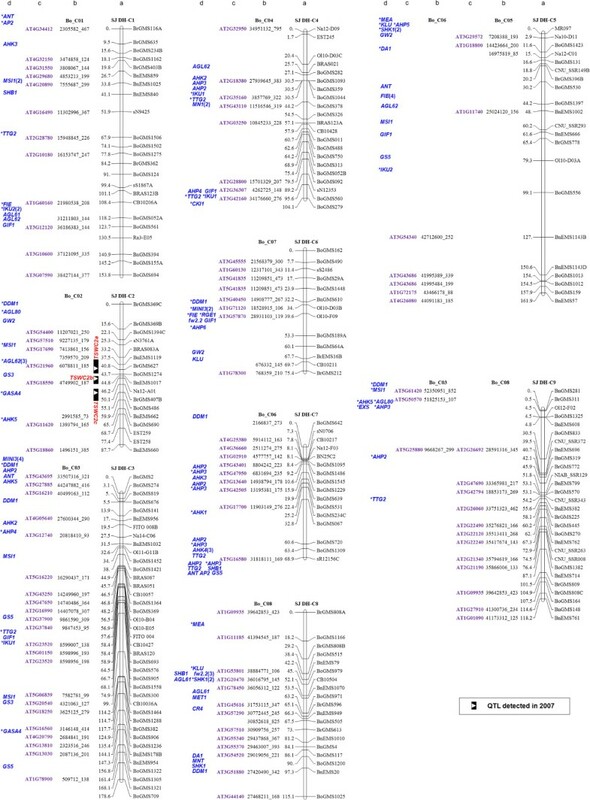 Each of the LGs is represented with a vertical bar with the locus position (in cM) on the left and SSR loci names on the right. The QTLs information (peak, interval and name) of TSW were on the left-hand of the LGs. Column b lists the homologous colinear loci in B. rapa or B. oleracea. The numbers designate the physical position in B. rapa or B. oleracea chromosome with the length of amplification fragment. Column c is the Arabidopsis gene codes corresponding to the homologous loci. Column d lists the homologous genes of seed size or weight identified in B. rapa and B. oleracea. Genes that are in good fit into both Arabidopsis and B. rapa/B. oleracea physical positions are marked with asterisks. Numbers in brackets are the tandem repeat times of the tandem repeated genes. With the newly integrated map, the QTLs for TSW in the SJ DH population were re-scanned. A total of 12 QTLs of TSW were identified on 7 LGs (Additional file 7: Table S2), including three previously unidentified QTLs on LG C2 were detected in the year 2007, due to more molecular markers now available on the integrated map, which resulted in a higher density and better resolution in identification of subtle changes caused by genotypic effects. The distribution and effect of other QTLs, including two major QTLs (TSWA7a and TSWA7b) remained largely unchanged (Additional file 7: Table S2). With the primers (see Additional file 1: Table S1 for primer sequences) of the SSR markers mapped on the B. napus LGs, electronic-PCR (e-PCR) was performed using the genome sequence of B. rapa or B. oleracea as templates to obtain fragments amplified in respective genomes (amplicons). A computer program (e-PCRmap) was developed to operate the e-PCR process. In total, 945 amplified loci were obtained in the B. rapa and B. oleracea genomes with the primer sequences of 385 SSRs mapped on the SJ DH linkage map (Table 1 and Additional file 1: Table S1). From these analyses, 421 homologous colinear loci (amplicons that can be matched onto corresponding B. napus LGs) were identified (Table 1). Due to the highly colinearity between the A- and C- genome in B. napus, a SSR locus on a particular LG on B. napus may produce amplicons in both the B. rapa and B. oleracea genomes (Table 1; Additional files 3, 4, 5 and 6: Figure S1-S4). Colinearity analysis between the B. napus LGs and the B. rapa/B. oleracea chromosomes showed the following three characteristics. First, some of B. napus LGs had high colinearity with the corresponding chromosomes of their progenitor species, B. rapa and B. oleracea, such as the LGs A1/C1, A2/C2, A3/C3, A4/C4 of B. napus that exhibited a sole colinear relationship with the chromosome A1, A2, A3, A4 in B. rapa and C1, C2, C3, C4 in B. oleracea, respectively (Figures 1 and 2; Additional file 3: Figure S1 and Additional file 4: Figure S2). Second, the LGs C6 and C7 of B. napus were colinear with the chromosome C7 and C6 of B. oleracea, respectively (Additional file 5: Figure S3). Such a corresponding relationship between LG C6 and chromosome C7 as well as LG C7 and chromosome C6 is likely resulted from the switched original labeling for B. napus linkage groups [45, 46], as pointed out by Panjabi et al.. Third, some of B. napus LG had a complex colinear relationship with the progenitor species due to the translocations during the evolution of the tetraploid species. Such a complexity is characterized by that a single B. napus LG may have syntenic segments from several chromosomes from B. rapa and /or B. oleracea. For example, the B. rapa chromosome A7 (BrA7) was found to have colinear segments on B. napus LGs C6 and C7, while the BrA6 segments existed in both LGs A6 and C5, and the BoC8 in LGs A8, C8 and C9, respectively (Figures 1 and 2; Additional file 5: Figure S3 and Additional file 6: Figure S4). In addition, LG C5 contained a homologous segment of BoC05 at its upper part and a homologous segment of BoC06 at its lower part (Figure 2). It was worth pointing out that B. napus LG C9 was largely colinear with BrA9, BoC8 and partly BoC3 simultaneously, rather than with BoC9. The LG A9 was short and thus no corresponding colinear segments could be matched with it. The short LG A9 is likely due to the low polymorphism between the two parental lines and thus fewer markers available for this linkage group. Such a result was consistent with our previous analysis . By BLASTn analysis  against the Arabidopsis genome sequences (TAIR10) , the 421 homologous colinear loci from the B. rapa and B. oleracea genomes were aligned onto 398 homologous loci in Arabidopsis, with 212 loci from B. rapa and 186 from B. oleracea, respectively (Tables 1 and 2; Additional files 3, 4, 5 and 6: Figure S1-S4). These homologous loci were evenly distributed in the A and C genomes of B. napus, with 208 loci in LG A1-A10, and 190 loci in LG C1-C9 (Table 2). There were 23 amplicons without matched Arabidopsis homologous loci (Table 2 and Additional files 3, 4, 5 and 6: Figure S1-S4). In total, 71 Arabidopsis conserved blocks were resolved in the B. napus genome (Table 2 and Additional files 3, 4, 5 and 6: Figure S1-S4). The conserved blocks covered 1,411.3 cM of B. napus genetic linkage map, accounting for 66.4% of total length of the genetic map (Additional file 8: Table S3). a Chromosome of B. rapa (A-genome) or B. oleracea (C-genome). c The number of unique blocks in a given B. napus LG. The conserved blocks were named according to Schranz et al. and identified by the method described by Parkin et al.. A conserved block contained a minimum of three mapped SSR loci with at least two homologous loci from one of the 24 defined Arabidopsis bocks  every 10 cM in B. napus genetic map. Subsequently, a comparative map between Arabidopsis genome and the B. napus map based on SSR markers was constructed with the aid of B. rapa/B. oleracea genome sequences (Additional files 3, 4, 5 and 6: Figure S1-S4). In total, 385 SSR loci from B. napus exhibited synteny to Arabidopsis genes, but 114 SSR loci did not find any homologous regions in Arabidopsis (including 20 no amplification SSR loci). Altogether, 271 SSR loci on B. napus LGs were identified homologous to Arabidopsis (Additional files 3, 4, 5 and 6: Figure S1-S4; Additional file 1: Table S1). Previously, we identified several QTLs for seed weight and fatty acid content with the SJ-DH population, and cloned the candidate genes underlying the QTLs. Those QTLs include two QTLs for seed weight on A5 (TSWA5b and TSWA5c), one for oleic acid content on A5 (OLEA5), and two for linolenic acid content on A4 (LNAA4) and C4 (LNAC4), respectively [11, 47]. To test whether the comparative map could be used to target the candidate genes for mapped QTLs, we searched for the candidate genes underlying the mapped QTLs. 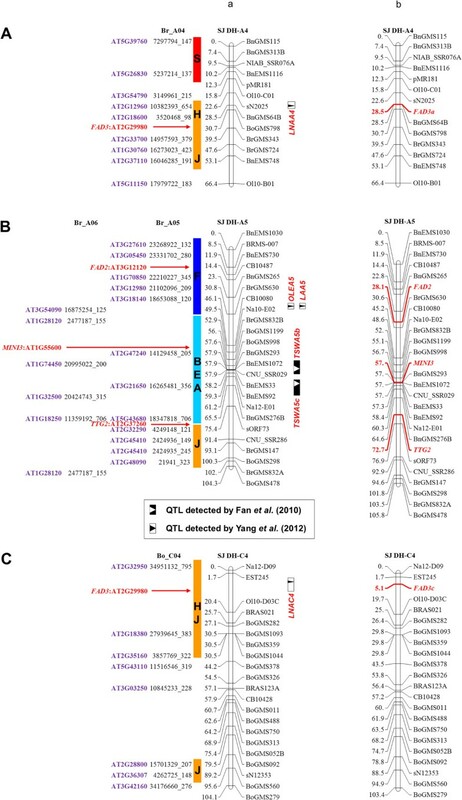 It was found that the F block on LG A5 contained a FAD2 gene for OLEA5 , the H/J blocks on LG A4 and C4 harbored a FAD3 gene for LNAA4 and LNAC4, respectively (Figure 3A and 3C, column a). Similarly, the MINI3 gene for TSWA5b, TTG2 gene for TSWA5c could be predicted (Figure 3B, column a). Above predictions were exactly same as the previous analysis through homology cloning (Figure 3, column b) [11, 47], demonstrating that the constructed comparative map can be effectively used in identification of candidate genes of mapped QTLs. Candidate genes underlying the QTLs identified through comparative mapping. Candidate genes for mapped QTLs on LGs A4 (A), A5 (B) and C4 (C) are predicted with conserved Arabidopsis blocks mapped on B. napus map. Column a illustrates the prediction of the candidate genes. Previously mapped QTLs [11, 47] are indicated on the right-hand side of the respective LG and the conserved Arabidopsis blocks (color bars with their names (letters) inside) on the left. The homologous loci in B. rapa/B. oleracea and Arabidopsis are listed next to the conserved blocks. Red arrows indicate the positions of the predicted candidate genes. Column b presents LGs A4 (A), A5 (B) and C4 (C) with newly added gene-specific markers. Sequence information was collected for 43 genes involved in the regulation of seed/fruit size or weight previously reported in tomato, maize, rice and Arabidopsis (Table 3). The ORF sequences of the genes were used for BLAST analysis against the B. rapa and B. oleracea genome. In total, 286 corresponding genes/loci in the two species were obtained with 132 from B. rapa and 154 from B. oleracea, respectively (Table 3; Additional file 9: Table S4). Among the 286 loci, 244 corresponded to the 35 seed size genes from Arabidopsis and the rest of 42 to the 8 genes from other species (Table 4; Additional file 9: Table S4). a The homologous gene number was calculated based on the distribution on BoC7 because the LG C6 of B. napus has a high colinearity with BoC7. b The homologous gene number was calculated based on the distribution on BoC6 because the LG C7 of B. napus has a high colinearity with BoC6. The copy numbers of the corresponding homologues in B. rapa and B. oleracea genomes varied. On average, one gene had 3 copies in the A genome and 3.6 copies in the C genome (Table 3). B. rapa and B. oleracea homologues for all genes were identified except for the gene qSW5/GW5 from rice (Table 3). Based on the colinear relationship between the A and C genome in three species (Table 1), the homologous genes were mapped onto the B. napus linkage map except the genes that currently are located only in the scaffolds of the B. rapa and B. oleracea genomes (Table 4; Figures 1 and 2, column d). Because of the fact that the LG C6 of B. napus was colinear with BoC7, and the LG C7 was colinear with BoC6, the homologous genes from BoC6 were placed on the LG C7 and BoC7 on LG C6, respectively (Figure 2). In total, 227 homologous genes of seed size/weight were finally positioned on the B. napus linkage map, which distributed on all LGs except A9 (Figures 1, 2; Table 4). Among the 185 Arabidopsis homologous genes mapped, 100 genes fell in conserved Arabidopsis genomic blocks and can be positioned exactly on the B. rapa/B. oleracea chromosomes (Figures 1 and 2, genes with asterisk). 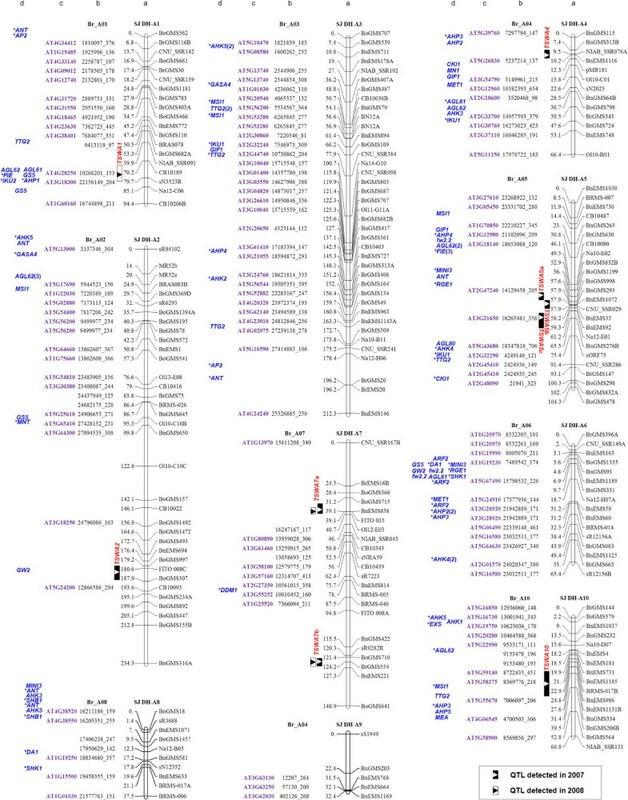 There were 20 homologous genes with tandem repeats (TR), among which three were from the homologous genes in crop species and 17 from Arabidopsis. Seventeen TRs genes were anchored onto the linkage map and the other three located in scaffolds of B. rapa/B. oleracea (Figures 1 and 2). The seed size/weight gene distribution map was used to identify candidate genes for the TSW QTLs by aligning the seed weight genes with the TSW QTL loci on the B. napus genetic map (Figures 1 and 2). On LG A1, TTG2 and GS5 were the nearest genes on each side of TSWA1 (Figure 1 and Additional file 9: Table S4); GW2 was located at the same position of TSWA2 (Figure 1 and Additional file 9: Table S4); CKI1 and MN1 were nearby the peak of TSWA4 (Figure 1 and Additional file 9: Table S4). MINI3 and FIE were located nearby previously mapped TSWA5a and TSWA5b. The MINI3 gene was located in the confidence interval of TSWA5b, consistent to our previous results , while the FIE gene fell into the confidence interval of TSWA5a (Figure 1 and Additional file 9: Table S4). Three genes, AHP3, AHP5 and MEA, were located in the same confidence interval of TSWA10 (Figure 1 and Additional file 9: Table S4). In addition, AGL62, GS3 and GASA4 were located on the peaks or in the confidence intervals of three newly identified QTLs, TSWC2a, TSWC2b and TSWC2c, respectively (Figure 2 and Additional file 9: Table S4). Together, above analysis clearly pinpointed the potential target genes for the mapped QTLs, providing valuable clues for a further comparison of sequence differences between two parental lines. However, for the two major QTLs, TSWA7a and TSWA7b, no known information about candidate genes could be inferred from the map, suggesting that those QTLs may be unique in B. napus or B. rapa genome. The only one seed size/weight gene, DDM1, on LG A7 was far away from these two QTLs, thus unlikely the candidate gene for the two QTLs (Figure 1). The Arabidopsis AP2 (AtAP2, AT4G36920) gene has been reported to affect seed size . AtAP2 was located on the U-block of LG A1 in the comparative map (Figure 4A). Although no mapped QTL is matched to the predicted AP2 gene, we reasoned that it is possible to find polymorphism of the locus between the two parental lines. To test this hypothesis, we set out to clone the homologous gene of AtAP2 in B. napus. We searched for the homologous sequences in B. rapa genome with BLASTn by using AT4G36920 as a query. Primers were designed based on the retrieved sequence of BrAP2 gene in B. rapa and the BnAP2 gene was cloned in the two parental lines of the SJ DH population, respectively (Figure 4B and 4C; Additional file 10: Figure S5). 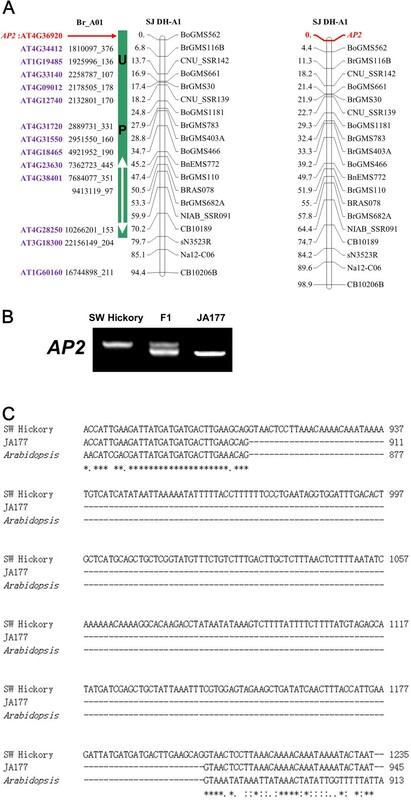 Sequence analysis showed that the allele in SW Hickory contained a 290bp insertion compared to JA177 (Figure 4C and Additional file 10: Figure S5). A BnAP2 gene-specific marker was developed based on the polymorphism between the two parents and used to map the gene in the SJ-DH population again. Genetic linkage analysis eventually mapped the BnAP2 gene-specific marker onto the U block on LG A1, consistent with the predicted result on the comparative map (Figure 4A). Cloning of the BnAP2 gene with the aid of the comparative map. A) Localization of the BnAP2 gene and its allele-specific marker on LG A1. The red arrow on the left panel marks the AP2 position as predicted in conserved block U. The right panel is a reconstructed LG A1 with the BnAP2 allele-specific marker. B) PCR products amplified from the parental lines and their F1. The PCR products are separated by electrophoresis in 1.0% agarose gels and stained with ethidium bromide. C) Sequence difference of the BnAP2 gene sequences between the two parental lines. There is a 290bp insertion in SW Hickory. In this study, we developed a procedure for comparative mapping between B. napus and Arabidopsis with SSR markers with the aid of B. rapa and B. oleracea genome sequences. To the best of our knowledge, this is the first report to construct a comparative map among Arabidopsis and three Brassica species with a SSR-based genetic map (Additional files 3, 4, 5 and 6: Figure S1-S4; Additional file 1: Table S1). The SSR markers have been widely used as a preferable type of molecular marker in genetic mapping in Brassica species. However, it was difficult to use a SSR map for comparative mapping with Arabidopsis directly. First, individual SSR primer pairs only have limited sequence information, which renders a direct alignment with Arabidopsis genome ineffective. For example, in a study to construct a mainly SSR-based integrated map in B. napus, Wang et al. found that <2% of the primer pairs could identify homologous regions to Arabidopsis, of which only 50% agreed with those identified using the corresponding SSR clone sequences. Second, high homology between the A and C genomes often results in multiple polymorphic loci in B. napus for a single Arabidopsis gene, which further complicates the comparative analysis between B. napus and Arabidopsis. In this study, we circumvented the two difficulties by making use of recently released genomic sequences of B. rapa and B. oleracea. Through anchoring the SSR loci on B. napus LGs to the B. rapa/B. oleracea genome by e-PCR, we were able to match the B. napus SSR loci with their Arabidopsis homologues, thus making such a comparative mapping feasible. By overcoming the difficulties in comparative mapping using a SSR-based genetic map of B. napus and Arabidopsis genomic sequences, this procedure thus proved a novel idea for a comprehensive comparison among Arabidopsis, B. napus and its two progenitor species, B. rapa and B. oleracea. To make use of the information derived the SSR loci as much as possible, a less stringent E-value was initially used in this study to identify more putative homologous loci. As indicated by Lukens et al., a less stringent cutoff could result in more non-specific region of homology. However, since our major purpose in this study was to establish colinear relationships between B. napus and Arabidopsis through the conserved blocks, such non-specific homology regions in the initial screening will be re-examined. With the criterion for identification of conserved blocks, such non-specific loci will not affect the determination of the conserved blocks. This is evident through the data listed in Additional file 1: Table S1, in which about 66% of the loci under the less stringent (E-value >1E-05) cutoff eventually were linked to a perspective block, indicating that some weak but biologically relevant sequence relationships could be revealed with such a procedure, which reduces the loss of valuable information from the SSR loci on the B. napus map. The establishment of such a comparative map offers an effective way to transfer the gene information from model plant Arabidopsis to B. napus, an amphidiploid crop species, as demonstrated by mapping the seed size/weight genes on the B. napus genetic map (Figures 1 and 2). Furthermore, we identified candidate genes for eight TSW QTLs through the mapping (Figures 1 and 2; Additional files 3, 4, 5 and 6: Figure S1-S4). Together, the seed distribution map and the identified candidate genes for mapped TSW QTLs provide valuable information about the genetic control of seed weight in B. napus. Although such a list of seed size/weight genes could be further expanded by including other genes related to the process of seed development, our results do exemplify the universal usefulness of such an approach. A flow diagram for the process is presented in Additional file 11: Figure S6. Mapping of the seed weight related genes and the candidate genes for TSW QTLs could accelerate the molecular cloning and functional characterization of the QTLs. As shown in Figure 3, the prediction of the candidate genes for several mapped QTLs is accurate. Such a process will allow us to isolate the potential candidate genes for a particular QTL by homologous cloning strategy rather than tedious and time-consuming traditional map-based cloning procedure. On the other hand, by cloning some of predicted potential candidate genes that were even not located in the genetic map, for example AP2 in this study, it is possible to uncover the polymorphic alleles in two parental lines without QTL mapping information (Figure 4). By doing so, we were able to develop an allele-specific marker for one of locus of the AP2 gene in B. napus and place the marker on the corresponding LG (Figure 4). There are three and two copies of the AtAP2 homologues identified in B. rapa (including one copy located on a scaffold) and B. oleracea, respectively (Table 3; Additional file 9: Table S4). Consistently, there are four copies mapped on LGs A1, A3, C1 and C7 of the B. napus genetic map, respectively (Figures 1 and 2). Although the exact molecular significance of the insertion in the cloned BnAP2 allele of SW Hickory is yet to be established, identification of the polymorphic locus between the two parental lines lays foundation for further functional characterization of all the AP2 alleles in the B. napus genome. The seed weight genetic map revealed the complexity of the genetic control of seed weight in amphidiploid rapeseed. For example, a single TSW QTL may have one or multiple candidate gene(s), such as TSWA2 (with only one gene, GW2, located) and TSWA1 (with 6 genes located) (Figure 1 and Additional file 9: Table S4). Mapping of these candidate genes could apparently narrow down the range of the potential target genes. Of course, even though potential candidate genes are mapped to a locus, this does not imply that they control the trait. The QTL may result from variation in other novel genes which have not been studied in model systems. It is interesting to notice that some genes showing major effects on seed size/weight in rice and Arabidopsis, such as GS3, GS5, GW2 and MINI3, TTG2, ARF2, IKU2, were located on the minor QTLs regions, or even not in the confidence intervals of previously mapped TSW QTLs (Figures 1 and 2; Additional file 9: Table S4). In addition, no homologue of qSW5/GW5, an important rice seed size gene [56, 57] could be identified in both the A- and C- genome (Table 3). A more comprehensive evaluation of B. napus germplasm is needed to understand whether these genes may exhibit different effects on the studied trait in various species. On the other hand, no candidate genes for two previously mapped major QTLs, TSWA7a and TSWA7b were identified, suggesting that the two QTLs may represent novel determinants for seed weight in amphidiploid B. napus. We developed a procedure for comparative mapping between B. napus and A. thaliana with SSR markers with the aid of B. rapa and B. oleracea genome sequences. Such a SSR-based genetic map can be used to pinpoint the candidate genes for QTLs important in crop improvement. The procedure may also find wide applicability in Brassicaceae and other crop species, as candidate genes for QTLs in other pathways could be identified through a similar approach. We thank Professor Edgar Cahoon at Center for Plant Science Innovation, University of Nebraska–Lincoln, USA and Dr. Muhammad Younas at National Key Laboratory of Crop Genetic Improvement, Huazhong Agricultural University, China, for critical reading of the manuscript. We are grateful to two anonymous reviewers for their valuable comments and suggestions on the manuscript. The work is financially supported by the funding from Ministry of Science and Technology of China (Grant nos. 2006CB101604, 2006AA10A113 and 2011AA10A104), Ministry of Agriculture of China (nycytx-00503), National Natural Science Foundation of China (31171188) and Huazhong Agricultural University (STSIF 2010YB05). YZ and GC conceived the research. GC, YY, QY, ZZ, HC, JW and CF performed genetic mapping and collected the seed gene data. YY wrote the computer program and assisted in bioinformatic analysis. GC and YY performed the comparative mapping. GC carried out the molecular cloning. GC and YZ wrote the paper. All authors read and approved the final manuscript.